Senator Edward M. Kennedy died late Tuesday night at age 77. 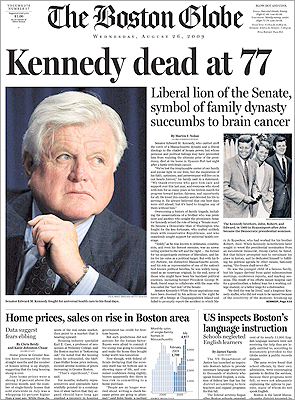 On the East Coast and in countries across the Atlantic, many newspapers had finished printing their Wednesday editions before they could include the Massachusetts senators death. But some papers did manage to feature the late breaking news on their front pages.